A couple of days ago, Palm Sunday, I preached at Christ Church Cathedral in Cincinnati. A few people asked me about my sermon text, which I didn’t have, since I preached without notes. As best I can remember, this is what I said. Also, up through Palm Sunday, I had been putting a scripture, an image, and a prayer here every day. I’m not doing that in Holy Week, obviously. If you like that sort of thing, head over to the most excellent blog of Penny Nash, which you should be following in any case. Anyway, my sermon is below. On a spring day some 2,000 years ago in Jerusalem, two processions entered the city. * From the east comes a haphazard procession of people who believe the world can be different. They are carrying branches, and their leader rides a donkey. It’s a protest of sorts. It’s a procession of hope. From the west comes a Roman army, marching with weapons and armor. It’s a procession of fear. When these two processions collide, events spin out of control, and the Passion we remember is the result. Each of the four Gospels tells the Passion story in a slightly different way. St. Luke takes great care to point out that Jesus was innocent. While other Gospels have the centurion saying Jesus is the Son of God, it is Luke who puts the word “innocent” into the centurion’s mouth. In Luke’s version, Pilate does every possible thing to get Jesus out of condemnation, but events are out of control. Luke is also the only Gospel which tells us that the sun was darkened as Jesus died. For Luke, the Passion — this collision — has cosmic significance. The Passion is the result of a cosmic collision between hope and fear. The Cross reminds us this collision. Over twenty centuries, we Christians have gotten in wrong much of the time. Too often, we reduce the Cross to a bumper sticker. “Jesus died for our sins.” “With the Cross, the debt of sin is paid.” These are merely caricatures, and like good caricatures, they are true but show only a partial and distorted picture. We have to know more of the complexity of the Cross to understand it. Too often, we have used the Cross to scapegoat particular people for Christ’s death. But the reality is that the Passion is the collision of God’s perfect love and our human sinfulness. It was not one group who killed Jesus, but rather humanity as a whole. Any of us sinners could have done this. Too often, we have distorted the Cross to sanctify suffering, as if God wills us to suffer. My reading of the scriptures suggest that suffering is never God’s desire for us, but that God does promise to be with us when we suffer. Far from being a sanction of suffering, the Cross is our rescue from it. The collision of hope and fear was inevitable. This Cross, then, stands as a warning to us. Now we know what might well happen when hope and fear meet. Two thousand years of Christian martyrs — witnesses of God’s love and hope — bear testimony to the reality of this warning. But the Cross is also a promise. We know how the story turns out! You can almost smell the lilies and hear the glorious music! Today we gaze at the Cross, but Easter is coming!Hope and fear meet. Jesus is executed, and just when it seems that fear won, God defeats death. Hope wins. Love wins. The Cross, then, is a promise that God’s love will always win, because if God defeated the worst thing the world could do, then God can defeat the challenges we face. And what of our lives? I don’t know about you, but I end up in the “safe” procession too often. I convince myself that the reasonable place to be is with the safe people, to be in the procession that makes sense. That’s not where Christians belong. We belong over in the hope procession, the one with the crazy people who believe that the world can change. We belong with the people who say we don’t have to live in a world where a few people have more of the stuff while others are poor. We don’t have to live in a world where there are lonely people. We don’t have to live in a world of illness and disease. Over here, over here in the hope procession, it doesn’t make sense. The kingdom of God is here! This is where the fun is, by the way. It’s also the dangerous one. Over here in the procession of love, we are likely to get into trouble. What we say from over here doesn’t make sense much of the time. We are proclaiming a message of hope. Which procession will you join? What would Cincinnati be like if we marched out of here in a procession of hope? What if we acted as if we believe that the kingdom of God is here? What if we stopped worrying about making sense, and started acting like God’s love? It will be dangerous, but there is nothing whatsoever in the Gospel about being safe or taking the easy way. We know what might happen. The Cross is a warning. But the Cross is also a promise. We know that the whole Passion story shows that God’s love for us is boundless. The whole Passion story shows that hope and love can defeat fear. The Cross is a warning. And we have God’s promise. Thanks be to God. * = For my awareness of these two processions, I’m indebted to Marcus Borg and John Dominic Crossan, in their little book, The Last Week. 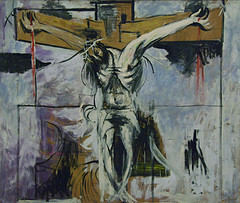 The painting is “Study for Crucifixion” (1947) by Graham Sutherland — in the Vatican Museums. I took the photo, and you can find more photos from that trip on flickr. Thank you for this understanding of the Passion and Palm Sunday. I have always had a very hard time with this day because the only time I rejoiced at a death was when Osama bin Laden was killed. So, it has taken a long time to be able to admit that I could be part of the crowd calling for the crucifixtion. I think of that moment as such a demonstration of our fallen nature…. It does help to see it as a chaos that results from a collision of hope and fear. But that understanding is also very depressing, because it suggests that MLKing’s death was inevitable, and foretells other deaths in the future as well….. Wonderful sermon, esp. the comments about suffering. I do wonder how to subscribe to Penny Nash’s blog. There doesn’t seem to be any info on her site. Thanks so much!!! For Lent, our parish read “The Last Week” and discussed it in various small groups, so I thought a lot about the two processions on Palm Sunday. I’m going to forward your sermon to the small group I was in, as I know they will appreciate it too. I also really liked your daily art/photo/scripture posts. They were a piece of my Lenten journey this year. Blessings.